Matte foundations can often appear quite flat, removing all traces of radiance from the complexion as it tries to keep skin shine-free. A necessary evil? Not anymore! Now, you can have it all thanks to Givenchy’s new foundation; Matissime Velvet. 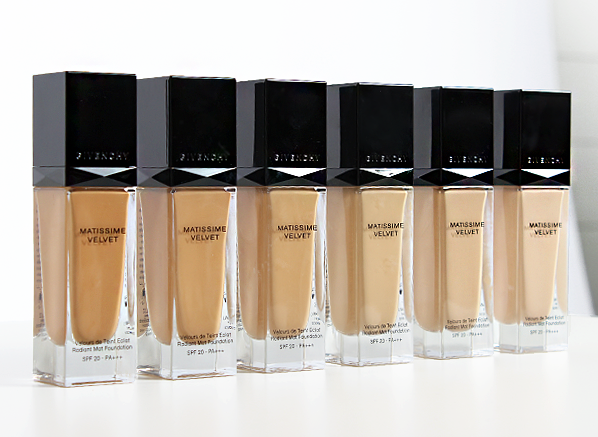 A matte foundation with a difference, Matissime Velvet is inspired by, yes you guessed it: velvet. Designed for those that want a matte finish that still allows natural radiance to shine through, it’s the best of both worlds! Some foundations absorb excess sebum so aggressively that they end up making the situation even worse, leaving the complexion imbalanced and often producing more oil than before! Givenchy’s Matissime Velvet has reinvented what it means to wear matte, focusing on keeping the complexion balanced and comfortable. This balance is achieved thanks to dual-mattifying technology, which harnesses the power of silica microspheres, composed of multiple micro-canals that improve sebum and moisture absorption while allowing skin to breathe. The second phase contains a botanical trio that acts on sebum in a targeted manner, helping skin to regain and maintain its balance, without drying out the complexion. And there’s more! Matissime Velvet is packed to the brim with even more innovative ingredients that help to keep the skin looking and feeling its best. To keep the skin clear Matissime Velvet draws from the power of black cumin oil, which is renowned for its purifying benefits. Ginger, burnet and cinnamon extracts can also be found working away in the formula, tightening pores upon application, for a smooth and flawless finish. And, last but certainly not least, pigments are protected by an amino acid coating, which extends colour hold, for coverage you can truly count on. Matissime Velvet has a very liquid texture that glides effortlessly over the skin, leaving a finish that is both luminous and matte. As it is inspired by velvet, the foundation hides shine and pores but never dulls the skin, instead the complexion looks and feels smooth with a natural glow. The wear time is also something to write home about as skin remains even and comfortable all-day, without any oiliness peeking through. 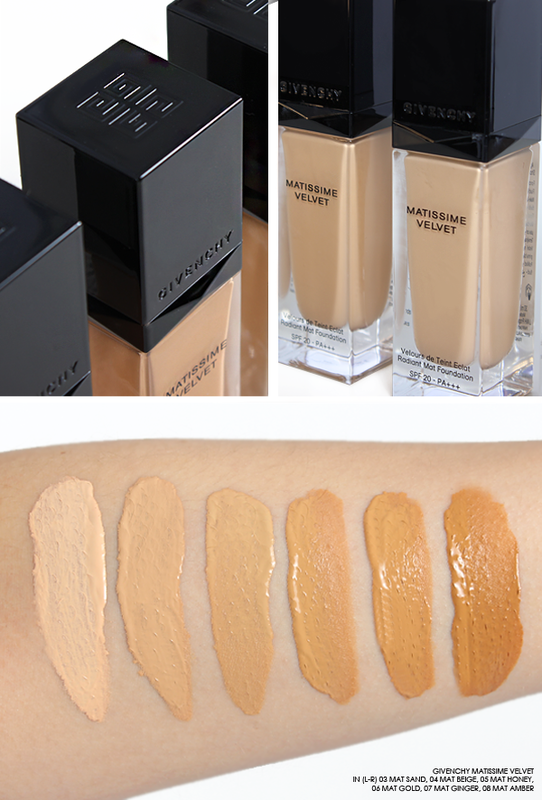 Available in 8 shades, Givenchy Matissime Velvet is for you if you love matte foundations, but not their often dull and flat finish. Think healthy skin that’s soft, smooth and completely shine-free and you’ve got Matissime Velvet in one! This entry was posted on Monday, May 15th, 2017 at 9:20 am and is filed under Make-up, New products, Spotlight On, Swatches, Tried & Tested. You can follow any responses to this entry through the RSS 2.0 feed. You can skip to the end and leave a response. Pinging is currently not allowed. what shade do you use on face?